We're in the midst of winter; the weather is chilly and the days are short. It's the perfect time for this month's feature — the Snowy Owl. The Snowy Owl is a special wild pet because it only spawns during winter. It follows the real-world seasons (NA region), which means you can find them in Winterspring right now. This pet will continue spawning throughout the winter months, however once the cold season ends the Snowy Owl will hibernate until next winter. 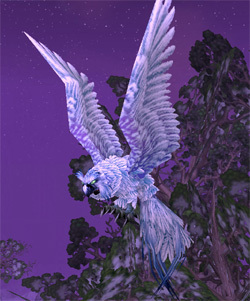 The Snowy Owl can be found in various spots in Winterspring as a primary pet. It comes in three different breeds, one of which sets it apart from its fellow owls. It's the only owl that has a Speed/Balance stat allocation. Finding your own Snowy Owl might take some time, but don't give up! It's possible that by removing other critters and wild pets in the area, spawn points may be freed up allowing for the Snowy Owl to spawn. Another method for locating one is to try your luck on different servers. Collecting a Snowy Owl will bring you one step closer to completing the achievement World Safari. One more reason to head out and capture your own owl; don't miss out on this winter pet! The Snowy Owl is one of several pets with the Owl moveset, all of which are deadly Flying damage dealers. It can use Peck or Quills as a decent first-line offensive attack. Peck is a no-frills single hit, while Quills hits several times, with an additional hit if your owl is faster. Cyclone in the second slot gives an RNG-heavy chance to attack all the pets in your opponent's team at the end of each round. Sharing that second slot, Shriek (pictured above) decreases your opponent's attacks by 25% for the next 3 rounds. It's the only defense the Snowy Owl has to speak of, so it may be a hard choice between the 2 depending on your opponent. There's an edge to choosing Cyclone in 3-pet fights & Shriek in single-pet fights, though there's a bit of latitude in making that choice. The big time damage dealers are both in the last slot. Nocturnal Strike needs a partner with Blind to be effective, but it hits extremely hard when you have that partner. Predatory Strike hits fairly hard most of the time, but when your opponent is below 25% health, it hits hard enough to end the fight, barring dodges or boss buffs or other tomfoolery. Both have very long cooldowns, so use them as wisely as any owl might. Check out our forum thread discussion on the Snowy Owl and submit your own thoughts on this pet. I still have not found a rare after all this time =( Been out hunting, lucky if i see 5 through the whole area. Not to mention it is a cute owl.